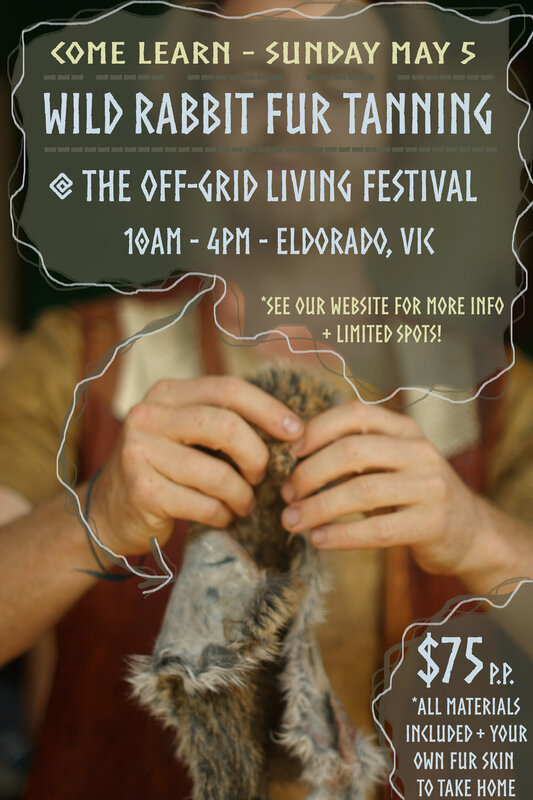 The Bush Tannery presents: 'Wild Rabbit Fur Tanning’ - An Off-grid Living Festival Special on the day after the main festival, onsite with Josh McLean between 10am to 4pm (BYO lunch/ snacks/ water) at the ‘Tiny Tannery’. While it normally takes a few days to process a fur skin from start to finish using all natural and traditional methods, in this one day workshop you will be exposed to a lot of the tools and knowledge necessary to begin or improve your fur skin and leather making journey. So what are you waiting for? No experience necessary and I’m looking forward to meeting you and sharing what I consider a very valuable off-grid living skill that you can continue for many years to come! *Child friendly/ family/ all abilities friendly workshop, so please fill in the contact form (CLICK HERE) if you think your child and or dependent person will require support throughout the workshop and we can talk about how that might work. Step into the drivers seat of a full day experience with one of the world's oldest trades.... traditional tanning (Fur Skin tanning). Your facilitator (Josh McLean), learned the skills of traditional tanning many moons ago in the Arctic of Lapland, Sweden. From his mentor and Master Tanner Lotta Rahme (www.lottasgarveri.se), Josh has been adapting and practicing recipes based on thousands of years of wisdom teachings for the past 4 years now back home in Australia. Most of these teachings have been passed on to Lotta as she travelled the world experiencing various forms of traditional tanning and her own adaptions. Lotta still runs her own tannery in Sigtuna (a medieval town of Sweden, South of Stockholm). 'Fur Skin' tanning has been seen across the globe in various ancient cultures (including our own Indigenous people in Australia), and our more recent cultures as a practical and ethical source for producing versatile fur items. An ‘off-grid’ skill existing since the beginning of time! While we face dark times with 'factory farming' and the poor treatment of animals across the world, the reality is that animals do die even outside of these realms, and can be treated and preserved in ways that are ethical, natural, sustainable, simple and practical based on our ancestral knowledge..... The methods we will be learning together over the full day workshop will show you how to produce an incredibly durable, washable and practical textile for an incredible amount of uses and will last you a lifetime, if not more when correctly stored and looked after. **The skins supplied will come from a local hunter in Victoria. What do you get for investing $75 into the day? - By the end of the day your body mind and spirit will need adequate resting, feeling confident that you or someone you teach can also make fur skins, honouring whichever animal comes into your life. At this point you may be asking yourself.... IS THIS FOR ME? Can I really take a dead animal hide and go through an entire day of transforming it into a fur skin? That said, these are very physically involved workshops. However, if for some reason you are unable to complete any of the steps, you are more than welcome to still attend, even just for the experience. You will also receive assistance every step of the way and like you, other participants will also be learning from little to no experience. Bookings are already being taken and due to the amount of preparation and space available, tickets will be capped to 12 students. See you there! Any questions or feedback, please don't hesitate to contact me on 0484594773 (9am - 6pm) or fill in the contact form.